Following the magnificent security gains there is music again in al Kut, Iraq. 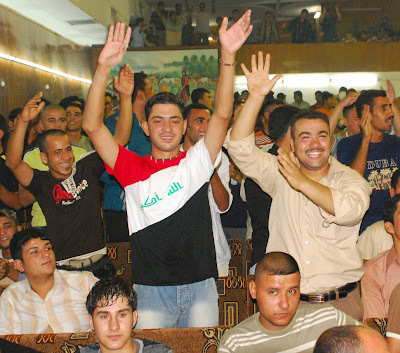 The assembled crowd cheered when the Iraqi constitution was read that outlined the rights and freedoms entitled to every Iraqi. Discussing the Rule of Law and human rights does not normally bring a large crowd, but the people of al Kut swarmed to the al Kut Municipal Theater recently to hear such a message. Approximately 900 people attended a two-day performance by two famous Iraqi singers organized by the Wasit Provincial Reconstruction Team (PRT). “It has been five years since singing was allowed in Wasit,” said Sabah al-Kayat, one of the performers for the event. “The PRT continues to plan and support cultural events that stimulate a cultural revitalization and return to normalcy in Wasit through plays, films, poetry contests and journalism conferences,” said Vanessa Beary, the Wasit PRT public diplomacy officer. This return to normalcy would not be possible without the support of the Iraqi Security Forces, the PRT and Coalition forces. 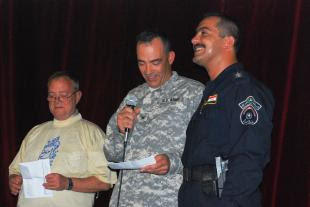 “I’m really so happy and joyful to be among you today, with my sons and brothers from the (Iraqi) Police and the Iraqi Army in this song recital, which expresses the freedom of all Iraqi people in our society to express himself in various ways according to the law,” said Maj. Gen. Hamood Facil Hanin, provincial directorate of police, during his remarks at the first night of the event. Hanin went on to read excerpts from the Iraqi constitution, outlining rights and freedoms entitled to every Iraqi. His remarks were met with enthusiastic applause from the crowd.